The capability to do rapid design and virtual prototyping of Internet of Things (IoT) edge devices is a competitive advantage for companies seeking to make a big impact in emerging markets with as little up-front investment and risk as possible. Currently, this type of risk is mitigated by prototyping – an iterative process that can cost from $100k to $1M per foundry run depending on the complexity of the process. In addition, prototyping is time consuming and can significantly increase time-to-market. Simulation that can handle large-scale, real-world problems can reduce the number of prototyping iterations required, reducing cost, time-to-market, and mitigating the risks that come with developing new technology. In this blog post, we discuss the design and simulation of a piezoelectric micromachined ultrasonic transducer (PMUT), a type of MEMS device typically used in range-finding applications, the creation of a behavioral model of the sensor in OnScale’s simulation environment, and the integration of analog front-end electronics for MEMS-IC co-simulation. Leveraging the powerful combination of OnScale’s multiphysics Cloud-enabled simulation tools with the TannerTools design suite from Mentor Graphics, we illustrate how end-to-end virtual prototyping of IoT sensor systems is now possible. This post describes a more in-depth discussion in Mentor Graphic’s whitepaper entitled From Proof-of-Concept to Product: Initial Design of a MEMS Sensor. This example focuses on the development of a tank fluid-level monitoring system for the food and beverage industry. This system can be deployed in breweries, wineries, and other beverage facilities at the IoT edge to collect the status of the fluid levels and to notify technicians proactively if there are any issues (such as leaks). The system utilizes a PMUT sensor to monitor the fluid level in the tank and periodically transmit measurements to a gateway device. 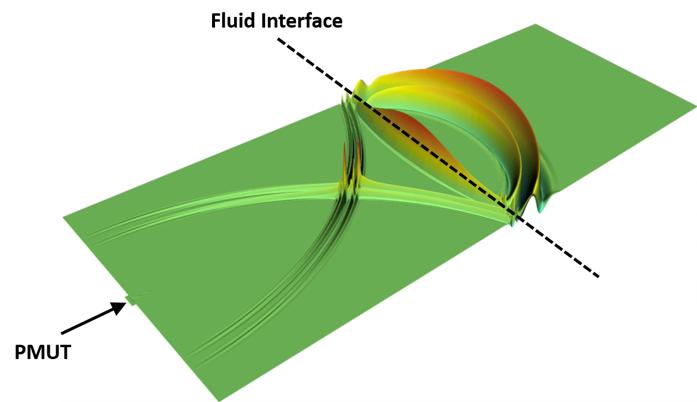 Figure 1: OnScale simulation of a propagating acoustic wave in a tank fluid-level monitoring system. A PMUT is an ultrasonic transducer consisting of a piezoelectric thin-film membrane (typically silicon (Si) and lead zirconate titanate (PZT) or aluminum nitride (AlN) material) suspended above a cavity. When an electric impulse is applied, the membrane vibrates, producing acoustic waves that can be used to detect the distance between the sensor and other objects. At its designed resonant frequency, a PMUT can produce a substantial amount of energy at very low power. Figure 2 shows a PMUT model deforming under electrical impulse. Figure 2: OnScale simulation of a representative cross section of a PMUT Transducer during actuation (exaggerated z-displacement). To optimize this design, we need to maximize the mechanical energy received by the PMUT from the acoustic reflection off of the fluid surface. We do this by building a design of experiments (DoE) in OnScale’s software that covers enough of the design space to contain our optimal solution. In this case specifically, we vary the PZT and membrane thicknesses to determine the best design. OnScale is able to simulate thousands of cases in a matter of minutes, illuminating the design space and allowing rapid optimization of the PMUT for our given specifications (Figure 3). Figure 3: Results of a resonant frequency design space exploration in OnScale. Coupling of the electromechanical simulation directly to the electronic design (EDA) workflow allows rapid optimization of the system in an environment that is predictive of real-world performance. Figure 5 shows the analog front-end used in this design. The PMUT is schematically captured in S-Edit from Mentor Graphics using a voltage source with the properties and parameters that match the output of the FEA study. Figure 4: Analog front-end for the PMUT transducer. When launching the simulation, S-Edit creates the complete Verilog-AMS netlist and passes it to T-Spice. T-Spice automatically adds analog/digital connection modules and then partitions the design for simulation. T-Spice simulates the analog (SPICE and Verilog-A) and sends the RTL to ModelSim® for digital simulation. Both simulators are invoked automatically and during simulation the signal values are passed back and forth between the simulators whenever there is a signal change at the analog/digital boundary. Figure 7 shows the results of the simulation. Figure 5 : System simulation results. We have shown how rapid design space exploration and integration with an EDA toolchain such as TannerTools by Mentor Graphics, can accelerate the design and virtual prototyping of an edge sensor. OnScale performs these explorations with state-of-the art multiphysics solvers on a massively parallel cloud infrastructure, enabling the Future of Engineering.